Pregnancy is a wonderful time of celebration, excitement, and change for families and couples who find themselves expecting a new addition to their home. It is also a tremendous time of physical change and physical stress for expectant mothers. Chiropractic care can help to alleviate pain and improve your overall wellness, especially when you are pregnant. In today’s blog from the chiropractic care team at Elevate Chiropractic in Fort Collins, we will explore the potential benefits of gentle chiropractic care during pregnancy. We will examine a couple of crucial ligaments and skeletal structures that we focus on, as well as the techniques that we use to analyze and align you to provide improved motion and decreased pain. If you would like to speak with one of the doctors at Elevate Chiropractic about whether or not chiropractic care is the right choice for you during your pregnancy, schedule an initial consultation today. What Are The Goals Of Chiropractic Care For Pregnant Women? When it comes to chiropractic care for women who are pregnant, we have two primary goals that we seek to achieve. The first is the reduction of pain, and the second is the improvement of movement. During pregnancy, hip, lower back, and other types of pain are not uncommon. As your body undergoes physical changes to accommodate the baby growing inside of it, musculoskeletal pressures can impinge on nerves in and around your pelvis, causing inflammation and pain. Through gentle analysis and adjustment, relief to these nerves can be achieved. Successful adjustment of the sacrum and other joints in the pelvic area not only can reduce pain, but they can actually improve neuro-biomechanical functions as well. These improvements in neural communications can provide additional benefits for both the developing baby and the mother. Another challenge faced by pregnant women is limited mobility. Although there are many factors that can contribute to this, most women will agree that as they move deeper into their second trimester and into the third trimester, they notice a difference in the flexibility and range of motion. Making sure that the joint systems around the uterus and hip area are in strong and appropriate alignment can help to improve movement and motor function of this area. Chiropractic care for pregnant women at Elevate Chiropractic takes a particularly close look at the round ligament and the uterosacral ligament — both of which are important structural elements of uterus support and nerve health during pregnancy. At Elevate Chiropractic, we practice the Webster Technique for evaluating and treating pregnant women. Developed by Dr. Larry Webster, DC over three decades ago, this technique focuses largely on addressing sacral subluxation and has been clinically observed to be associated with improved pregnancy outcomes. Dr. Webster went on to found the International Chiropractic Pediatric Association. To learn more about this organization and the Webster Technique, read this publication from the ICPA. The Webster Technique focuses on sacral subluxations, or compression and misalignment of the sacrum — a triangular bone in the lower back that is formed from fused vertebrae and that is situated between the two hip bones of the pelvis. This area of the body is home to extensive nerve networks, and as such, are prone to inflammation during the physical stresses of pregnancy. Through gentle analysis that takes into account your physical comfort and state during your pregnancy, we evaluate the physical context of your hips, pelvis, and sacrum before moving to make adjustments. Pregnant patients get to lay face down on pregnancy pillows — something that many of the pregnant women we see for chiropractic care claim is a real treat after being relegated to their backs and sides for months on end — and minor, gentle adjustments are made to help realign the joints to reduce pain and improve mobility. 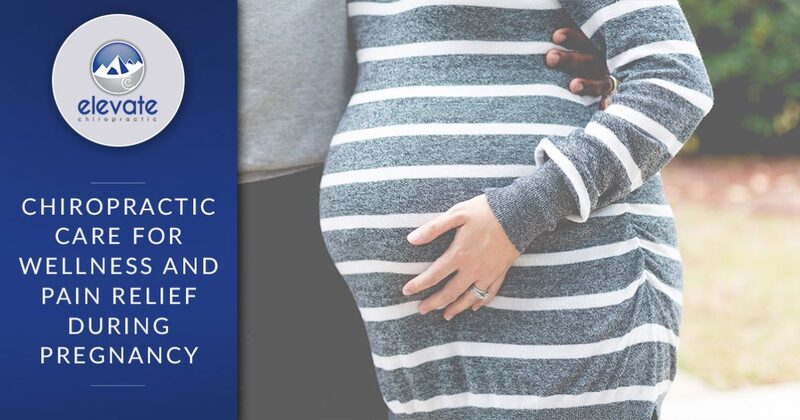 If you are pregnant and would like to learn more about the benefits of chiropractic care during this special, but physically stressful portion of your life, contact the team at Elevate Chiropractic today to schedule an appointment. We’re the chiropractic care team that you can trust for all of your family’s chiropractic and wellness needs.